(Los Angeles, CA) Film composer Christopher Young scores “Priest,” a post-apocalyptic sci-fi thriller, directed by Scott Charles Stewart (“Legion”). The gripping 3D film is set in an alternate world -- one ravaged by centuries of war between man and vampires. Sony Pictures releases the film May 13. Score album is released by Madison Gate Records and available on iTunes and Amazon.com. Young quipped that his score is, “Excessively aggressive and enveloping; it swallows you like a leviathan. It’s a powerhouse of constant energy. It’s like Godzilla f--ing King Kong.” It took an 83 piece orchestra and a 32 member choir to create the epic sound Young wanted. “Priest” is the first collaboration between Christopher Young and director Scott Charles Stewart. 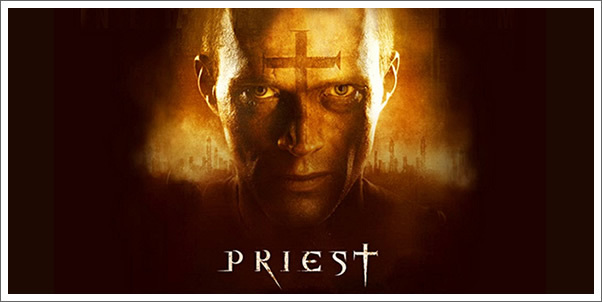 The film stars Paul Bettany as a legendary warrior priest during the last Vampire War, who now lives in obscurity among the other human inhabitants in walled-in dystopian cities controlled by the Church. When his niece (Lily Collins) is abducted by a murderous pack of vampires, Priest breaks his sacred vows to venture out on a quest to find her before they turn her into one of them.